On a brief visit to New York City earlier this week, I stopped in at a McDonald's restaurant and encountered a machine that replaces the human being who used to take your order. This is, of course, an entirely predictable consequence of Governor Cuomo and the legislature creating a special minimum wage for fast food workers. That wage, which is being phased in, reached $12 an hour in New York City on December 31, 2016, and is scheduled to climb to $15 on December 31, 2018. 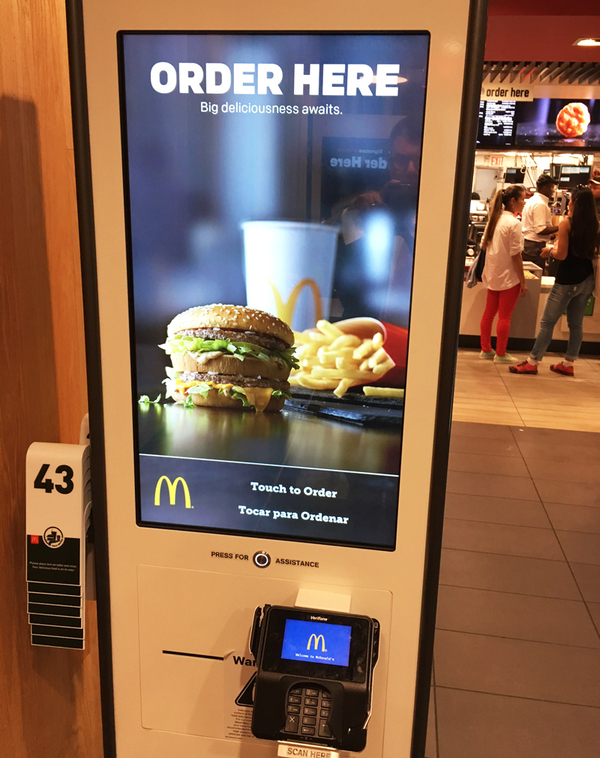 A machine that replaces a human order-taker at a McDonald's in New York City, where Governor Cuomo has increased the minimum wage for fast-food workers. New York is, as John Maynard Keynes put it in another context (as quoted in Benn Steil's The Battle of Bretton Woods), "fixing the wages of individuals at a higher figure than it pays their employers to give them."